On August 27th, come down to the Kokanee Creek Nature Centre to celebrate the return of the Kokanee salmon! Here, at the Nature Centre, we’ve been eagerly waiting all summer for the salmon to arrive, and they’re finally here! Our goal is to excite every guest that comes through our doors about nature and the value of protecting the environment; this job is never easier than when there are hundreds of bright red salmon spawning just outside. The Kokanee salmon are important in our park. Beyond providing visitors with a unique opportunity to get up close with nature, the salmon play a vital role in Kokanee Creek’s food web. As a food source for many organisms, including bears, birds, and otters, they are ecologically valuable. Once passing through the animals that benefit directly from them, the remains of the Kokanee nourish the soil, adding further value to the plants and animals in our park. For decades people have been coming to watch the Kokanee, after which our park, and the glacier that sits to the North of us, are named. At the Nature Centre we have had the opportunity to talk with many guests that remember visiting as children, and who have brought their own families back to experience what they saw years ago. If you would like to share this special experience with your family, join us at the Kokanee Creek Nature Centre on August 27th from 11-6pm, for live music, games, local vendors, and naturalist walks. 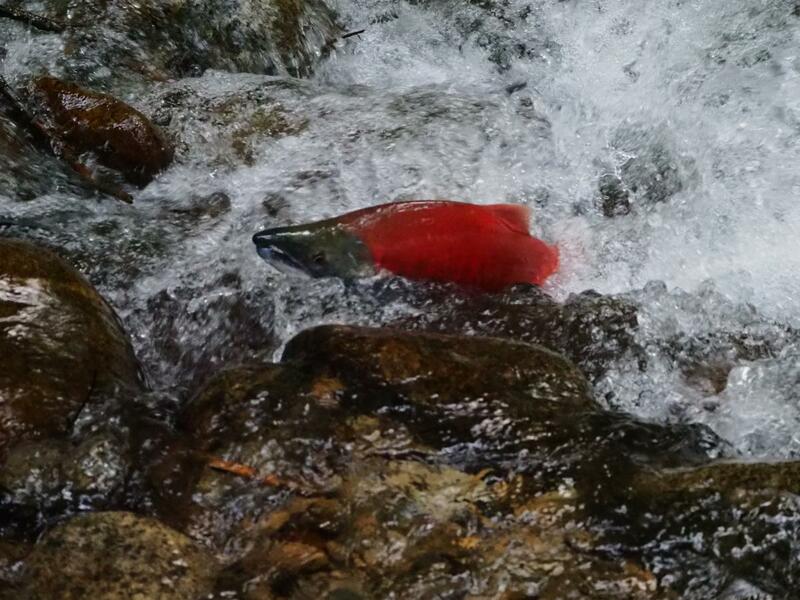 The Kokanee Creek Red Fish Festival is the best way to celebrate the Kokanee salmon.